Even though PlayerUnknown has stepped away from PUBG, the game’s Update #27 is set to hit the live servers next week, and its creators have confirmed it’s in its final stages of testing. The new update promises changes to weapons, world details and UI, so let’s dive in and see exactly what the devs are promising. Most important is the new season pass, Wildcard. 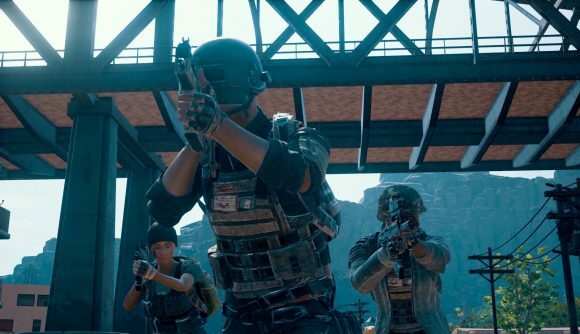 PUBG Corporation has promised that the pass will run for 10 weeks, from March 26 to June 4, and will include a breadth of new daily missions – including some beginner missions to teach new players about in-game mechanics. Players can expect over 60 rewards from the pass, ranging from character cosmetic items such as hair and face customisation, to new backpack skins. Each new level achieved in the pass will grant a coupon, which can be used in the in-game coupon store to allow players to redeem items. The Survival Title System has also received some changes, meaning that with every promotion to a new title through the system (above Novice), you receive coupons that can spent at the coupon store. This means that players have more than one way of unlocking new rewards offered by Survivor Pass 3: Wild card, so you can continue to play how you like. One of the most immediate things you’ll notice when logging in from next week, however, is the improved user-interface in the game’s menus, which should make team management that much easier. You can now adjust your teammate’s volume individually, too – particularly handy if you want to ignore someone after a bit of foul play. PUBG Corporation has also added a key-guide to the main menu too, so that you can remind yourself of the game’s many controls at any given moment. Read more: PUBG Guide: tips and tricks for Battlegrounds wins. There’s also set to be a few nifty changes to some of the game’s weapons. A new sub-machine gun, the MP5k, has been added in Vikendi, replacing the Vector on the map. The SMG boasts a higher damage-per-bullet and “reasonably easy to control recoil”, but the lower firing rate makes sure its DPS isn’t overpowered. It also boasts a higher magazine capacity than the Vector, with 30 rounds by default and 40 with an extended magazine. Changes have also been made to existing weapons to aid in game balance, such as reducing the M16A4’s initial recoil and decreased damage in some weapons. Notable are SMG and Pistol attachments, which have now combined into one category and can now be used across both types of weapons. This trend of streamlining continues, with all bullet loops now being combined into a new, simpler “Ammo Loop”. Players will rejoice to know that Enrangel now features a much higher item spawn rate, with particular emphasis on the spawn rate of AR, DMR, LMG and SMG weapon classes. The changes come just after the announcement that every map in the game is due a remaster, and the rebalancing will hopefully go along way to ensure Enrangel is a popular map once again. The devs have also heard recent complaints, and have decided to change the way Flare Guns both appear and interact with the world around them. Apparently, many fans were complaining that the original messages that came with the Flare Gun broke the gritty and realist tone of the game, and so it’s been down away with. Delivery planes have also been raised so that they create less of an impression on the game’s skyline, and the noise they produce has been heavily toned down so that players with headphones no longer feel as if they’re quite literally under a Boeing 747.